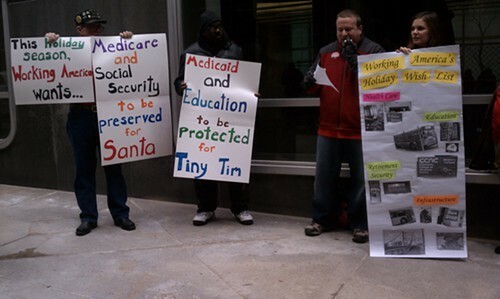 Members of Working America today presented Sen. Bob Casey's office with their Christmas "wish list," asking the Democratic Senator to fight to preserve Medicare, Medicaid and Social Security, while allowing President George W. Bush's tax cuts to expire. "We're calling on the Senator to galvanize his colleagues to protect our benefits," said Benita Campbell, a member of Working America. "We want him to mobilize his colleagues to the right thing." The group of about a dozen protesters presented a Casey aide with petitions and a holiday wish list which asked for health care, retirement security, infrastructure and education.